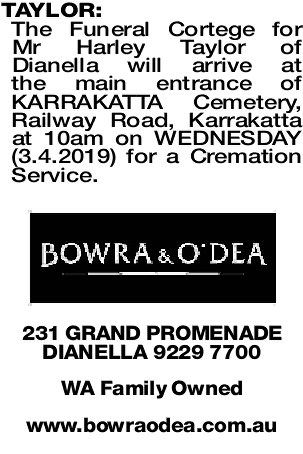 The Funeral Cortege for Mr Harley Taylor of Dianella will arrive at the main entrance of KARRAKATTA Cemetery, Railway Road, Karrakatta at 10am on WEDNESDAY (3.4.2019) for a Cremation Service. TAYLOR HARLEY Passed away peacefully on 26.3.2019. Beloved husband of Cath, devoted father of Sue, Maree and Anita. Father-in-law of Glenn, Russell and Jeff. Treasured Grandfather of Morgan, Larissa, Matt, Abbey, Ashley and Harley. A great bloke who was admired by so many. His humour and smile will be so greatly missed. Treasured memories of a wonderful uncle. Condolences to Cath, Sue, Maree, Anita and families. He will always be remembered. Ian, Ranelle, Gavin, Courtney and Josh. TAYLOR HARLEY An incredible man and amazing uncle. We were so lucky to have you in our lives and will miss you so much. Jill, Tara, Blair, Bec, Tanika and Chloe. TAYLOR HARLEY Condolences to Cath and family on their sad loss. Harley was a man of integrity, honesty and humility. A true gentle man and our friend.